There is a saying that dreaming of apricots brings you a good luck. 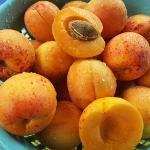 Try savory-sweet apricots and cook them for National Apricot Day on January 9. Apricots emerged in China 4,000 years ago and were spread by Persians throughout Asia and even introduced to the Mediterranean. Only centuries later Spanish brought apricots to the New World and planted trees all over the west coast. Today apricots grown in California's San Joaquin Valley make 95% of apricots grown in the U.S.
Do you know that word “apricot” has got Latin origin? It is translated as “precious”. This name could be explained by the fact that apricots ripen earlier than most of summer fruits. Fresh apricots are rich with vitamins A and C, fiber and potassium. The ripe apricots are also good for your skin and eyes. An ounce of apricots contains 20% of daily dose of beta-carotene! The easiest way to serve apricots is eating them fresh. But if you want something new, try to bake apricots or cook an apricot sauce to strain it over your ice cream.